The Protestant Reformation went through numerous fits and starts before finally gaining traction in the City of Wittenberg. It is ironic that Protestantism found its first true success in the very heart of the Papal-supported Holy Roman Empire, although the widespread decentralization of Imperial power in Central Europe perhaps made it the logical place for Protestantism to take hold. Its pre-16th century history notwithstanding, Wittenberg will forever be remembered for the fateful date of October 31, 1517, when Martin Luther’s writings gave birth to Protestant Christianity. Today the Castle Church is revered by Protestants the world over in much the same way as Istanbul is by the Orthodox Church. The Wittenberg Castle Church is part of the Luther Memorials UNESCO World Heritage Site. Discontent with the religious hegemony of the Catholic Church in Western and Northern Europe can be traced as far back to the 12th century when the Albigensians and Waldensianes first attempted to establish their own churches in Southern France. Although these and later movements under Jan Hus and John Wycliffe were crushed, growing anti-Catholic sentiment began to reach alarming levels throughout Europe by the beginning of the 16th century. In 1517, the dam finally burst when Martin Luther, an Augustinian monk, drew up one of the most important documents in history and posted it on the door of the Wittenberg Castle Church. His Ninety-Five Thesis, originally intended as a challenge to the Church’s selling of indulgences and other practices instead ignited the fire of the Protestant Reformation. Born into a prosperous family, Martin Luther spent most of his early life studying for a professional career, either as a civil servant or with the Church. He attended some of Germany’s most prestigious schools, including the University of Erfurt and the University of Wittenberg. He began teaching at the latter in 1508 shortly after becoming a priest, receiving a full doctorate in theology in 1512. It was not long, however, before Luther began to seriously question Church doctrine. Despite his discontent, it was apparently not Luther’s desire to break with the church, but rather to reform it, when he began to speak openly against the selling of indulgences, the practice of forgiveness of sin in exchange for monetary contributions to the Church. The Ninety-Five Thesis were a formal dissertation against this and other practices, and within months copies were circulating throughout Europe. After briefly ignoring Luther, the speed and scope with which his ideas were spreading shook the Church into action. He was denounced and branded as a heretic, but because he was supported by the powerful Frederick of Saxony, the Church could do little but meet him in debate. However, in 1519, Luther denounced the authority of the Pope outright, and the Protestant Reformation was on. From the outset, Wittenberg was a major hotbed of Reformation activity. Even after Luther fled the city following his denouncement of the Pope, oppressed Protestants began finding their way to Wittenberg. Foremost among these were the new Lutherans, those who subscribed to Luther’s teachings, as well as Hussites, Anabaptists and others. After Luther’s return to the city in 1522, the various groups were more or less consolidated under Luther’s leadership. The first Protestant Hymnal was completed here in 1524. Luther continued his efforts until the end of his life in 1546. He was buried in the Wittenberg Castle Church. Amazingly, Wittenberg remained relatively undisturbed during the Thirty Years War, which otherwise ravaged most of Central Europe. Even more amazingly, other than a brief engagement with the Austrians in the 18th century and occupation by Napolean’s forces in the early 19th century, Wittenberg has miraculously survived every major European war up through World War II. Today the Castle Church and other Luther monuments are among the most important and visited Protestant sites in the world. While the Protestant tradition generally does not subscribe to the idea of pilgrimage, if there is such a thing as a Protestant Mecca, Wittenberg would be it. The Wittenberg Castle Church, also known as All Saints Church, was actually a late addition to Wittenberg Castle, and was completed shortly before Luther became a teacher at the university there. The original castle was substantially damaged during the Seven Years War, and rebuilt in 1892. At the time of the restoration, one of the castle’s towers was incorporated into the church as a bell-tower. The famous original wooden doors were also damaged during this period and were replaced by bronze ones. 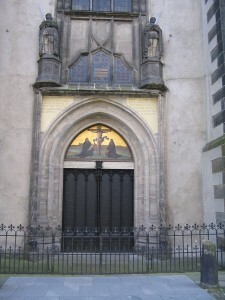 As a testament to Luther, the new doors were engraved with a copy of the Ninety-Five Thesis. When the church was rebuilt, the interior was reconstructed along its original design. Because of this it resembles an earlier church rather than a 19th century structure. A large stone marker topped with an engraved bronze plaque marks the spot where Martin Luther is buried. Bronze engravings of Luther are on the wall near the tomb. Also displayed within is an early copy of the 95 Thesis. A number of other pre-Lutheran relics are buried within the church as well. Wittenberg is home to a number of Luther and Reformation sites. The Martin Luther House, also known as the Lutherhalle, is now a museum dedicated to the Reformation and has a large collection of Luther-related curiosities. The Philip Melanchthon House located next door was home to one of Luther’s early followers and is also now a museum. A Martin Luther Memorial Statue also stands in the center of town. The nearby St. Mary’s Church is the city’s original Catholic parish church. To the west of Wittenberg is the city of Eisleben, where the Birthplace of Martin Luther is located. Also to the west is the city of Eisenach, location of Wartburg Castle, where Luther lived in exile for three years and where he jotted down many of his thoughts on religion. Extraordinary article and makes me know that while I have been to Israel I must visit Wittenberg Castle and the Church to further explore Luther’s writings. Absolutely. I was there for the 500th anniversary last year and it was an amazing experience.